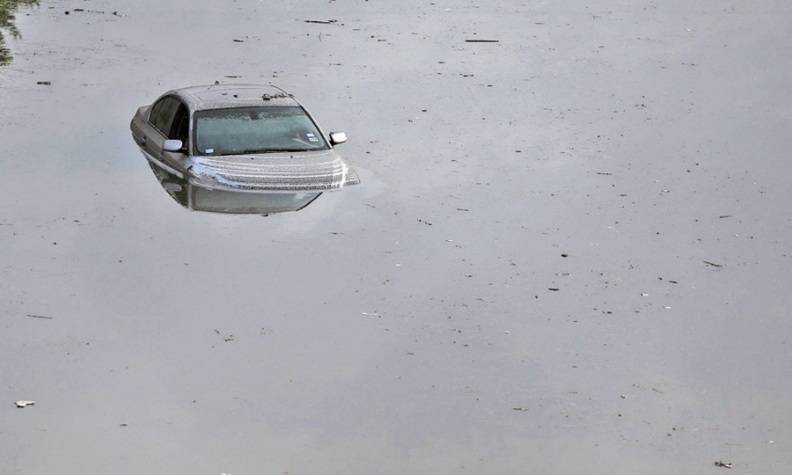 In May, 7,000 to 10,000 vehicles that were covered by insurance were soaked by floodwaters that hit Texas. And that's not including the countless cars and trucks that were uninsured. That is according to the National Insurance Crime Bureau, citing data from Copart, a salvage auction company. The bureau is funded by insurance companies and works to prevent insurance fraud. Historically, about half the vehicles damaged by floods are resold, some to unsuspecting buyers, Carfax Inc. estimates. The good news is that the federal vehicle electronic title-checking system, the National Motor Vehicle Title Information System, is firmly in place. Under the auspices of U.S. Department of Justice, the system's goal is to cut down on title fraud, which includes keeping unsuspecting consumers and dealers from being hosed by unscrupulous people selling dried-out salvage and junk cars and trucks. The bad news is that all states don't fully participate in the electronic system. Forty-four state motor vehicle titling agencies contribute vehicle title data to the system. Only 38 make inquiries before issuing new titles, according to the system's website, vehiclehistory.gov. Salvage yards, junkyards and auto recyclers from every state are required to submit monthly reports to the database. Ninety-six percent of the country's motor vehicle department titles are represented in the national title information system, based on 2012 Federal Highway Administration data, the system's website boasts. But holes in the system increase the likelihood that dried-out flood cars and rebuilt wrecks will be back on the road. Those bogus cars compromise vehicle safety, hurt prices and put consumers, dealers and auctions at risk. "Anytime you have a number of states not fully participating, you create some weakness in the system," said Jim Moors, director of franchising and state law at the National Automobile Dealers Association. The database of vehicle titles allows states to submit and share with one another information about damaged vehicles that have been issued title brands such as "junk," "scrapped," "salvage" and "water damage." Moors said that though he does not have data to back it up, title washing is still an industry concern for dealers. The concern becomes even more acute when there is a big storm such as Hurricane Katrina, which devastated New Orleans in 2005, or Superstorm Sandy, which soaked the East Coast in 2012. The Justice Department has worked hard to encourage states to participate fully and has seen significant, albeit slow, progress over the past five years, Moors said. "But I think we'll get there," he added. A common reason for delays is antiquated computer systems that are costly and time-consuming to replace, according to some states responding to queries from Automotive News. For example, the Oregon Department of Transportation is not participating in the national title information system because its outdated mainframe computer system operates on the COBOL computer programming language, which won't support the database, a spokesman said. COBOL stands for Common Business Oriented Language, which was popular in the 1960s. Tight budgets and the recession coupled with staff reductions prevented the state from updating the system, he added. But Oregon lawmakers in June passed a budget that includes funding to modernize the transportation department's computer and business systems. "The first thing we're going to do is the title and registration system," the spokesman said. "We have to select a vendor, select a solution and get it implemented. It's not just [the national title information system] -- it's going to make a whole lot of what we do so much easier and smoother. We won't see results for two or three years," he said. The National Motor Vehicle Title Information System was established under the Anti-Car Theft Act of 1992, according to the system's website. The Justice Department is responsible for its implementation and operation in partnership with the American Association of Motor Vehicle Administrators. The system's aim is to protect the public from illegal activities such as title fraud, odometer tampering, stolen vehicles and cloning -- stealing the vehicle identification number of a legitimately-owned vehicle and putting it on a stolen vehicle. The system contains vehicle title information from state motor vehicle titling agencies, insurance companies, auto recyclers, junkyards, and salvage yards. The information is available to consumers, dealers or anyone else for a fee. More than a dozen "approved data providers" are listed on the system's website and charge from about $3 to $13 per vehicle identification number checked. A spokeswoman for the Kansas Department of Transportation said the state is in the process of making technology improvements to its motor vehicle system and adding the national title information system is part of it. "But we don't have a set timeline for it yet," she said. State police Lt. Tim Charland, assigned to the enforcement and safety division of the Vermont Department of Motor Vehicles, said implementing the system is on his state's radar, but he did not know when it might happen. "It would be a benefit," he said. A spokesperson for the District of Columbia said its department of motor vehicles is implementing the national title database with a startup expected in December. One of the most recent states to expand its use of the federal title database is Texas. The state started contributing data to the system about six years ago, said Clint Thompson, chief of title services with the Texas Department of Motor Vehicles. Then in June 2014, after years of planning, two years of implementation and review and a $1.1 million investment, the state began checking the title of every used vehicle titled in the state against the federal database. Thompson said over the past year his department caught more than 15,000 errors related to title brands. Of that number, about 10,000 errors were related to data entry errors -- a clerk who processed the title failed to record the brand properly -- and about 4,300 titles were surrendered to the state without brands, although brand information should have been included. The state also found 229 titles for nonrepairable vehicles that should not have been on the road but were. "That was the reality before" the national title information system, Thompson said. "Now, we catch every one of those." There were multiple reasons it took Texas awhile to get onboard -- including budget constraints, Thompson said. But even after money was appropriated, it took time. In addition to creating the information technology programming, the effort included creating a unit of six employees solely to check vehicle titles. Thompson said the state's 245 counties had to be educated about the system and how to handle transactions and title errors. If those counties cannot resolve a title error, they turn it over to Thompson's unit, which handled 96,000 titles over the past year. Texas' implementation also included a public service marketing campaign -- "Don't buy a wreck, do a title check" -- to urge residents to check titles of used vehicles before purchase to avoid surprises when they approach the state for a title. "It was a huge undertaking," Thompson said. "It's not something that you just say, 'Hey, we're going to do this tomorrow.'"